Last week, on a cold dark and cloudy day in Amsterdam I was asked to take a look at a new “create your own mobile app” product called AppMachine. If I’m honest, I couldn’t have been less excited. See, we’re pitched mobile app publication tools every week and the majority are overwhelmingly disappointing. That being so, I might have passed on this offer if it weren’t for the fact that the startup came highly recommended via a TNW Co-founder. It wasn’t minutes into our meeting before it was clear that this was no ordinary startup. The company and its veteran entrepreneur founder/CEO Siebrand Dijkstra (pictured above), have seemingly done all they can to counter the famed Lean Startup strategy of launching with a minimum viable product and instead have produced one of the most powerful, feature rich products I’ve ever seen a startup produce on first launch. 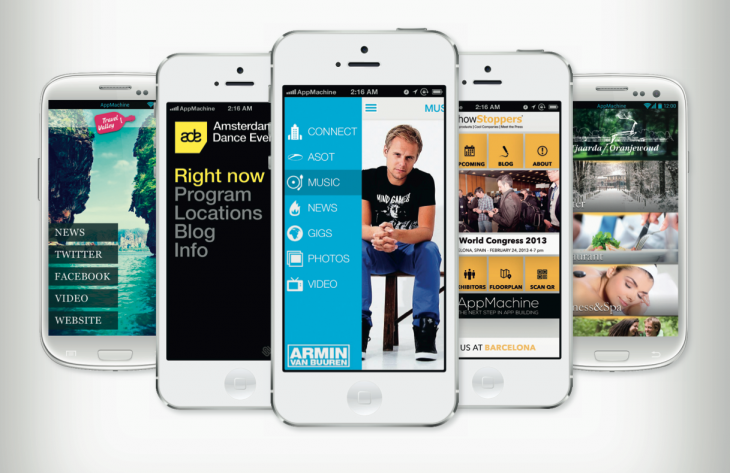 Today, after two years of self-funded development by 18 staff (Dijkstra has already sold four companies), AppMachine launches in beta at Mobile World Congress, aiming to disrupt the already big “build your own mobile app” market dominated by the likes of Mobile Roadie and Shoutem. While many mobile app creators rely on html5 to produce mobile apps, which essentially means wrapping a website around a frame to create a mobile app, AppMachine prides itself on producing native apps for both iPhone and Android. “Every time you activate apps of that kind (html5 apps), you have to download all the Web content first. That limits their interactivity and it makes them slower. So they’re a lot less enjoyable to use than native apps.” says AppMachine. AppMachine is taking a unique approach to pricing. Rather than charge a monthly recurring fee, the company has chosen to try charging a one-off fee for a published app. This means users just pay once for their app, and only after the app is published into the App Store. Prices vary between €399 ($529) and €699 ($927), depending on the version you’ve chosen to subscribe to. For most businesses just looking to build an app for themselves, the €399 ‘Gorgeous’ version will suffice. The AppMachine platform comes in three flavors: Gorgeous, Designer and Developer. Gorgeous is recommended for your average small business or individual looking to create an app on the fly, and fast. Designer takes it up a notch, making it possible for anyone (ideally a designer) to edit virtually every single detail of the app’s interface. You can not just change colors and layout, but also every minute detail of the apps identity from icons, through to hover effects, all images, color shades and more. The limitations on how beautiful your app can look are only down to the quality of your designer. Developer: The developer version will launch later this year, more details on that to come later. After two years of development, you would be right to expect a powerful product. AppMachine doesn’t let you down, but also makes it impressively simple. Dijkstra and his team of 18 developers have built an immensely powerful app CMS that I can foresee becoming actively used by businesses for their own apps but also by agencies for their customers too. With the ability to create an app based on templates, or completely from scratch, plus a plethora of integrations for news, products, location-based services, social media, photos, videos – for many, AppMachine will do all they need and more. For example, AppMachine also provides the “AppMachine Previewer”, which makes it possible for you to view the app live on your (or your customers’) phone as it’s being built. As I say, the antithesis of minimum viable product. However, it is early days, and while the platform is clearly impressive, building anything of this magnitude won’t be without hiccups, bugs and design polish – so perhaps wait until public launch in May 2013 before making the move to the platform. In the meantime, it’s well worth trying now though to get to grips with how the product works first hand. To do so, sign up here or watch the video below for a teaser of what to expect.